360Amigo System Speedup can help you to make you computer work faster and without errors. It is a full optimization and system cleaning tool. By means of a neat and tidy interface, it is a program that will be very easy to use for all users, even if they don't have too much experience. After using it for some time, our computer starts to accumulate programs that we don't use or that haven't been uninstalled properly, the hard drive becomes fragmented and the system registry file piles up errors. All this causes the computer's performance to deteriorate. 360Amigo System Speedup contains all the tools necessary to solve any problem with the system, and to apply effective cleaning methods that will speed up the processes. 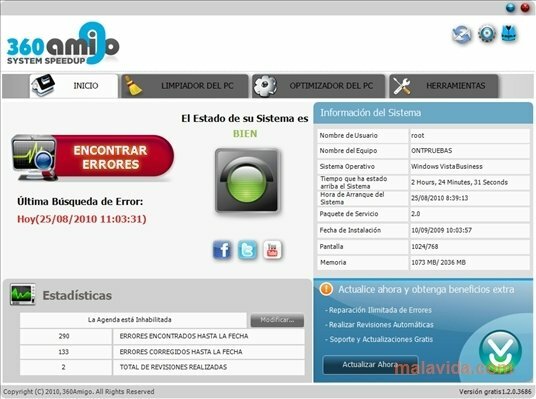 360Amigo System Speedup finds all the errors that can be found on your computer; performs a complete cleaning of the registry file; includes a useful uninstaller; defrags your computer's hard drives; includes a process manager that shows all the active processes and allows the user to terminate those that he wants; it also has an option with which you will be able to restore the system. Everything that you will need to make your computer work as well as possible.